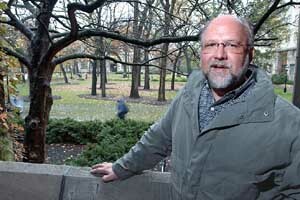 As University Planner, Richard Bumstead is effectively the University’s landscape architect. Though he is as proud as anyone of the University’s intellectual prowess and research triumphs, it is the campus flora for which he has been the chief steward for more than 20 years. His pride in the greenery of the campus is evident in the fact that the University is one of the few academic institutions in the world that holds the distinction of being an official botanical garden. The campus garnered that honor in 1997 from the American Association of Botanical Gardens and Arboreta. Can you sum up the state of our campus landscaping? “The past year has not been kind to the many graceful trees that shade the walks and lawns of the Main Quadrangles and elsewhere on campus. Some are well past their prime, and Facilities Services is often faced with replacing them because of decay and disease. Many others were lost in a July 5, 2003 storm that concentrated its winds on the trees on Jackson Park’s Wooded Island, the Midway Plaisance and in Washington Park, but which also wiped out dozens of old trees on the campus. Those trees have since been replaced with 63 new oaks, elms, black locusts and hawthorns. There obviously are trees that have been here a long time and some that have not. Can you sort them out for me? 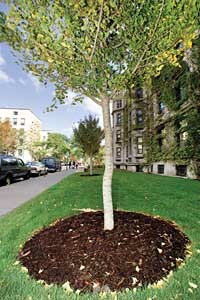 Trees that once lined the west side of the Snell-Hitchcock halls on Ellis Avenue have been replaced with new trees, such as the one above. The corner of Ellis Avenue and 57th Street also now has a low limestone wall surrounding the plants at the corner. “Most of the trees that were lost were elms, which were first planted at the turn of the 19th century after three feet of topsoil had been added to the planting pit to provide the elms with a stable base in which to root. After the Columbian Exposition of 1893, elms were planted along the entire east-west length of the Midway, but in the 1950s and ’70s, Dutch elm disease decimated the elms, and the Midway has since been replanted with a variety of shade trees, including lindens, honey locusts, red maples and hackberries. How are oaks an essential part of this campus and the heritage of this area? Just like the many building projects, there are many landscaping projects in progress across the campus. What is your current focus? 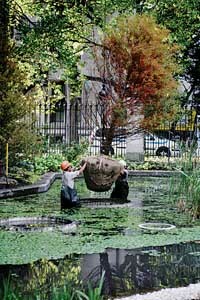 “A major landscaping project on the Quads is the restoration of Botany Pond, which was completed with the installation of the last three remaining trees: two bald cypresses and a weeping crab apple. It is one of the centerpieces of the campus, and we are all extremely pleased about how the restoration has shaped up. 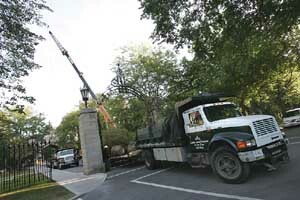 Trucks roll onto campus bringing new trees that crews of landscapers place in Botany Pond. The pond recently has been transformed to its original marsh-like environment. We have a master plan for construction. Is there something similar for landscaping?